The process of providing an incentive or encouraging people who already have a relationship with your brand to share your content with their friends. The process of partnering with online “influencers” (people who have a large following on social media sites) to create content that is posted to the influencers channels. Advocates are usually “everyday people” who have an average of 190 friends on Facebook. Influencers are professional publishers who have spent dedicated time building a following in a subject area. Advocate Marketing is great for brands with a valuable offer or valuable content and need a little extra help to make it “go viral”. Advocate Marketing can be as simple as a shareable coupon. More complex advocate marketing involves leaderboards and competitions that allow advocates to compete for rewards. Advocate Marketing usually comes from the social media budget. An Advocate program usually involves 100’s of advocates and reaches approximately 20,000 people (100 * 190). Influencer Marketing is great for brands who want to create compelling content AND distribute that content to a targeted audience. Influencer Marketing involves finding target influencers, pitching them a compelling assignment with a good value exchange (cash or equivalent), and then managing the posting process. Influencer Marketing usually comes from content creation or distribution (advertising) budgets. The average influencer in the TapInfluence Marketplace has a reach of about 10,000 people. Influencer Marketing programs engage between 5 and 500 influencers (5 if done manually, 500 if using automation software such as TapInfluence) and reach from 50,000 to 5,000,000 people (5-500 x 10,000). When brands ask us if they should be doing Advocate Marketing, our answer is a resounding “of course!” Advocate Marketing can easily be done manually or with a number of free or low-cost technology solutions – because much of the technology is already built into the social networks. Influencer Marketing is definitely a more “scaled” type of marketing with reach an average of 10x that of Advocate Marketing. Influencer Marketing is also much more challenging to scale without technology. Because you are actually creating content together with influencers, there is influencer recruiting, editorial calendars, compliance, and of course, tracking and analytics (which are a must since budgets often come from media and there is a need to perform on par or better than other types of media). Learn about our turnkey Influencer Marketing Platform. 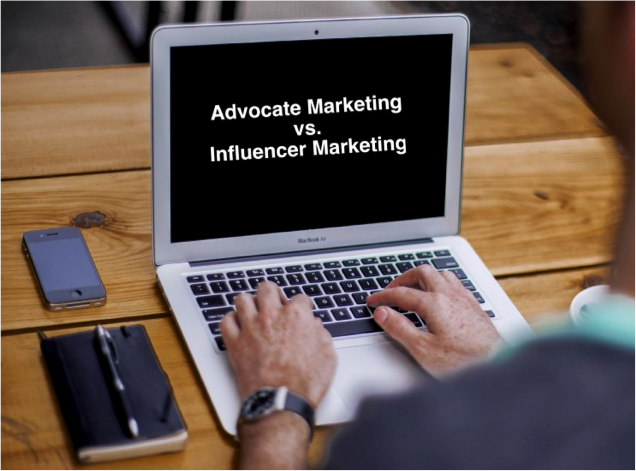 So should you be doing Influencer or Advocate Marketing? The answer is yes, you should be doing both. But if you are looking to reach the maximum number of people with your time, and want to leverage technology to give you that type of reach and scale, then you should start with Influencer Marketing.